Remington’s Golden Saber line is known among self-defense and concealed carry practitioners for its high quality and effectiveness. Its spiral-cut, brass-jacketed design is engineered for reliable expansion at lower velocities, a major advantage for the .45 ACP round. 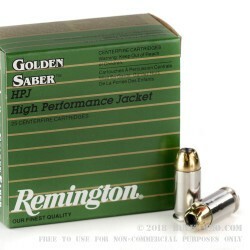 Golden Saber rounds come in boxes of 25. 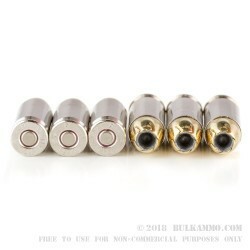 Each round is Boxer-primed with reloadable brass cases which are nickel plated for reliable feeding and ejection. 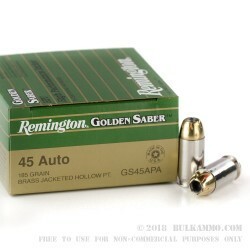 This standard-pressure loading of the Golden Saber in .45 achieves a muzzle velocity of 875 fps and offers reduced recoil compared to +P rounds and maintains compatibility with a wider range of firearms than its high-pressure counterpart. 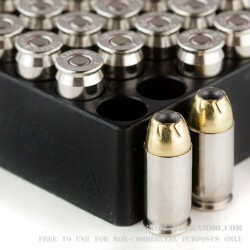 It is safe to use in any pistol chambered in .45 ACP. Remington is the oldest manufacturer of ammunition and firearms still in business in the United States. Founded in 1816 by Eliphalet Remington II, the company has evolved from making flintlock rifles to modern rifles and shotguns as well as a full line of range and self-defense ammo. The company recently introduced its take on the 1911, the Remington R1, chambered in .45 ACP.